Sakyamuni Buddha announced that 12 years after his parinirvana he would reappear through an immaculate birth in the country of Oddiyana, bearing the name Padmasambhava (The Lotus Born), and spread the teachings of the tantras. This rebirth came in the form of an eight-year-old child who appeared miraculously upon a lotus, at Danakosha Lake in Oddiyana. 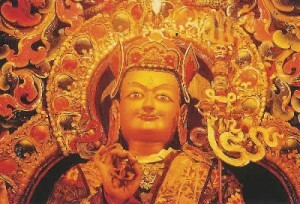 Padmasambhava is popularly known as Guru Rinpoche, the Precious Master. He was invited to Tibet by King Trisong Detsen to bring peace to the war torn lands of Tibet. His mastery and teachings created the foundation for the spread of Buddhism in Tibet. In 762, he founded Samye, Tibet’s first monastery. Miraculously, Guru Rinpoche left his signature throughout the Himalayan ranges in and around the many caves he used for meditation. At these sites one can still see handprints and footprints that he impressed into solid rock, testimony to the extraordinary power this fully accomplished tantric master held over the external and internal elements. It is believed that he stayed in Tibet for about 55 years, doing retreats in solitary places and caves* all over the Himalayas and giving innumerable teachings and transmissions of tantras. He had twenty-five main disciples. Some, such as his consort Yeshe Tsogyal, became renowned for their spiritual attainments. From this core group emerged the first seven Tibetan Buddhist monks. In Tibet and Nepal and a variety of other locations, Guru Padmasambhava, often assisted by Yeshe Tsogyal, hid countless teachings as treasures (Termas), in the forms of scriptures, images, transmissions and ritual objects, to be revealed at appropriate times in the future. 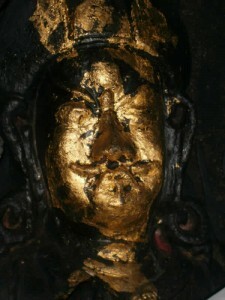 He is also well known as the creator of The Tibetan book of the Dead. It is said that Guru Rinpoche ascended from Tibet for the mystic ‘Copper-colored Mountain’, where he still resides. He is said to remain, in the immortal rainbow-body of great transference. He can be summoned through his powerful mantra of invocation anytime: ‘OM AH HUM VAJRA GURU PADMA SIDDHI HUM’. Upon leaving, he announced that he would return to remove the suffering of the people of the world on the tenth day of every moon—but especially on the tenth day of the monkey month of each year. I have discovered that according to the Tibetan Lunar Calendar, the tenth day of the monkey month in 2001 was June 30th, the exact time of my initiations. *Guru Rinpoche himself said that in all the caves and places he has meditated people in the future could receive his blessing as if meeting him in person. There are different kinds of caves which represent Guru Rinpoche’s enlightened aspects such as Body, Speech, Mind, Quality and Activity. Furthermore Guru Rinpoche mentioned that especially in the time of degeneration (Kaliyuga) visiting those Holy places would be very beneficial for one’s spiritual development and purification of sicknesses and obstacles. We will have the opportunity to visit his Enlightened: Body Cave, Speech Cave and Quality Cave, as well as Guru Rinpoche’s main consort Yeshe Tsogyal’s birthplace and cave in which she attained Enlightenment.